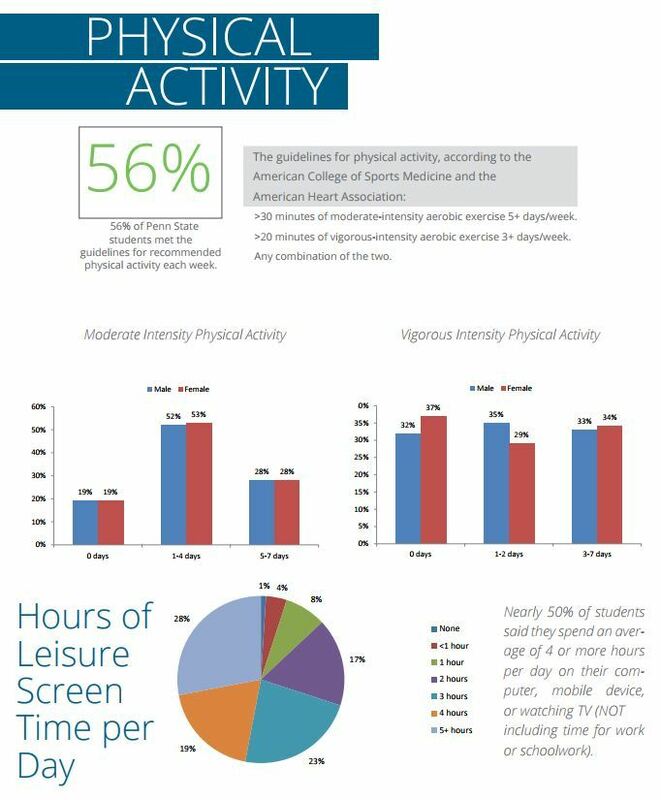 Being physically active in college is a great way to manage stress and maintain a healthy lifestyle. Working out is important to your physical and mental health. You might have questions about what to eat before and after workouts. I have done some research on the topic and want to share my findings with you. Eating a snack before working out in the morning will provide a boost of energy because your body has been fasting during the night. Eating a snack before working out in the late afternoon will also provide much needed energy given that you probably eat lunch several hours earlier. Experts in the field recommend that you eat something within one hour after working out to maximize recovery, if you are not planning to eat a regular meal. Below are some examples of balanced snacks and meals that will help fuel your body. The type of food you should eat before a workout depends on the type of activity that you have planned. For strength training, aim for a snack rich in protein. This may include 6 ounces low fat Greek yogurt and ¼ cup of almonds, string cheese or an energy bar with 8 or more grams of protein (1). For a cardio workout, complex carbohydrates are a great energy source. Examples include a small box of raisins (2 tablespoons), a small banana, or one slice of whole wheat bread with a thin layer of peanut butter. Try eating these foods 30-60 minutes before working out to allow time for digestion. If you exercise immediately before a meal like breakfast or lunch, then skip the post-workout snack and fuel your body with a healthy meal that contains quality carbohydrates and protein. Base your meal on the MyPlate guidelines to ensure that it is balanced and contains each food group (3). One example of a well-balanced meal is hard cooked eggs with a slice of whole grain toast and 100% fruit juice or oatmeal with berries and milk (2). If you workout later in the morning, try having a grilled chicken salad (with vegetables, nuts, quinoa and fruit such as apples or cranberries to provide a well-rounded meal with protein, fats, and carbohydrates) or turkey sub with whole wheat bread and a side of veggies for lunch. If you do not have a meal planned close to your workout, plan to have a snack to replenish carbohydrate stores and repair muscles. Examples of great post workout snacks include: one tablespoon of nut butter on apple slices, 6-8 ounces of low fat chocolate milk or a string cheese with a few whole grain crackers. Remember to hydrate and rehydrate! The American College of Sports Medicine recommends drinking 16-20 ounces of water at least 4 hours before working out and another 8-12 ounces 10 or 15 minutes after working out (4). Sip 3 to 8 ounces of water every 15 minutes during any work out that is less than 1 hour (1). Keep your body properly hydrated and fueled to get the best workout possible. We hope you have a fulfilling workout! Rosenbloom, Christine. “3 Easy Tips for Fueling Your Workout without Overdoing It.” Eat Right. Academy of Nutrition and Dietetics., 19 Oct. 2016, eatright.org/fitness/sports-and-performance/fueling-your-workout/3-easy-tips-for-fueling-your-workout-without-overdoing-it. SAVE THE DATE! 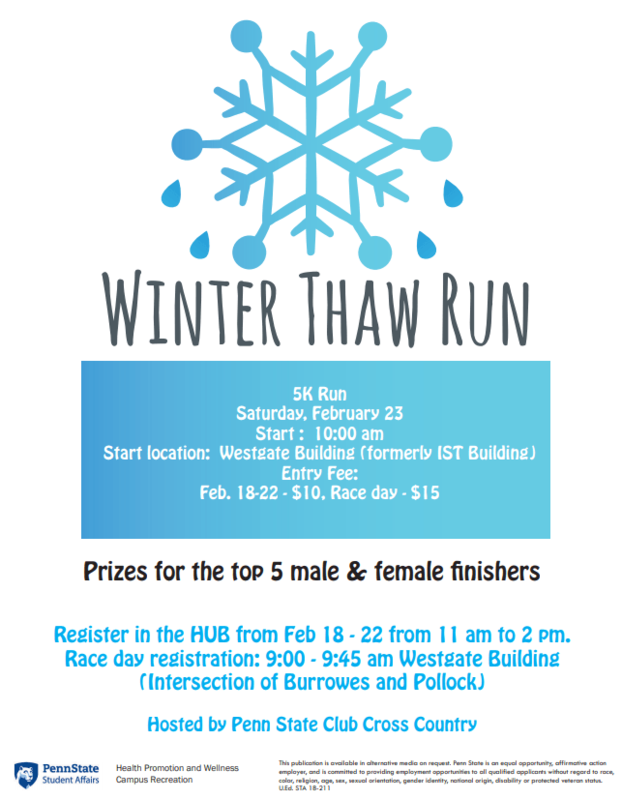 The Winter Thaw 5K is just around the corner. Saturday, Feb. 24th at 10am. Stay tuned for more information. Health Promotion and Wellness (HPW) has new space. The Wellness Suite is in 20 IM building, downstairs and next to Adventure Recreation. 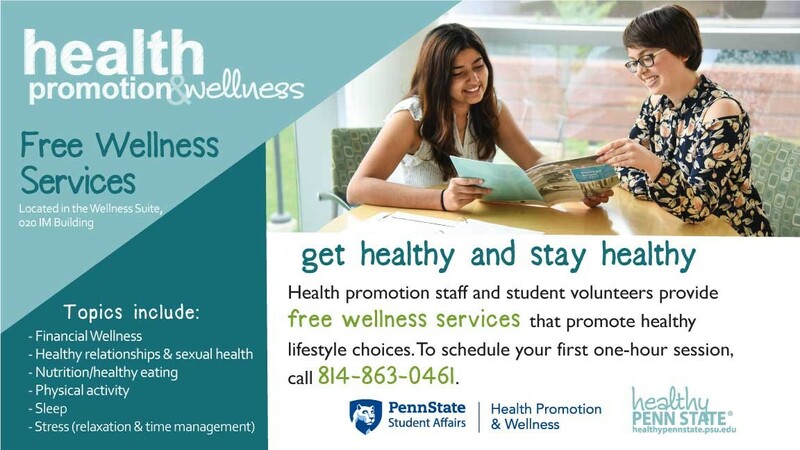 The Wellness Suite offers many great resources for students including walking maps, Manage Stress workbooks, Smart & Safe at State guides, and free wellness services. The wellness services are designed to help you set goals, develop skills and enhance your health behaviors. The topics include: nutrition, physical activity, sleep, stress (with an emphasis on time management or relaxation strategies), healthy relationships and financial wellness. HealthWorks peer educators facilitate the sessions. The services were developed using research-based models. Each service is designed to help students increase knowledge and learn new skills that contribute to healthy behaviors and academic success. Schedule an appointment by calling 814-863-0461. In the suite, you will find an area with tables, comfy chairs, and a relaxation room. It’s the prefect place to study or chill out in the middle of a busy day. 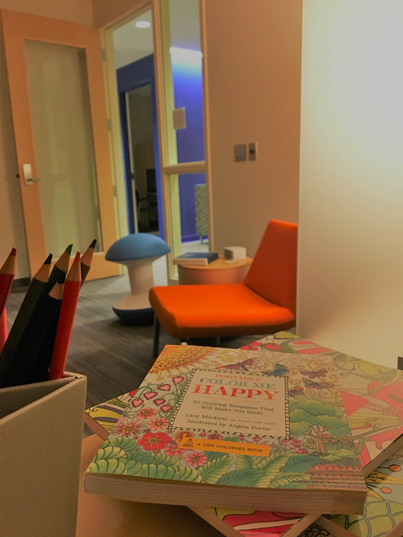 The relaxation room features coloring pages and colored pencils, meditation information, a zen garden, and biofeedback software. Visit the Wellness Suite this semester, open Monday–Friday 8am-5pm. 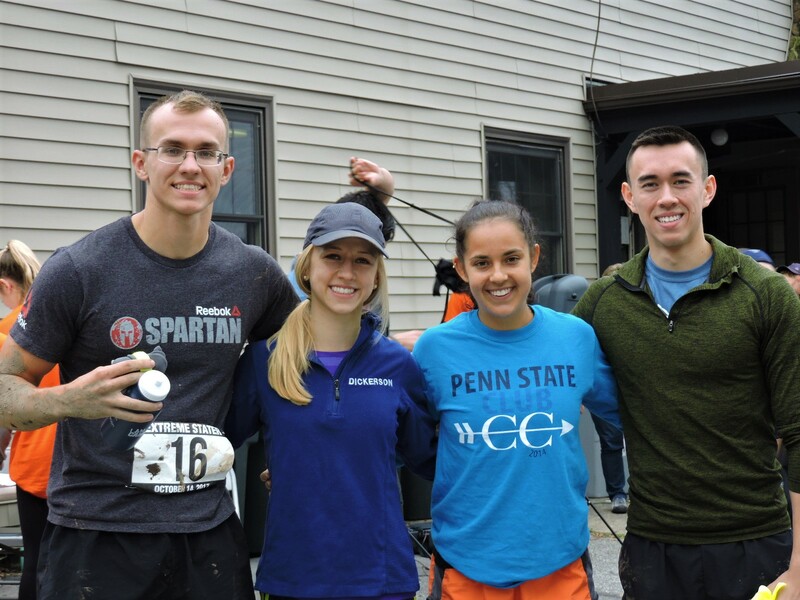 On Saturday, October 14th, 2017, Penn State Health Promotion & Wellness and Campus Recreation partnered to host the fifth annual Extreme Stater outdoor adventure race. 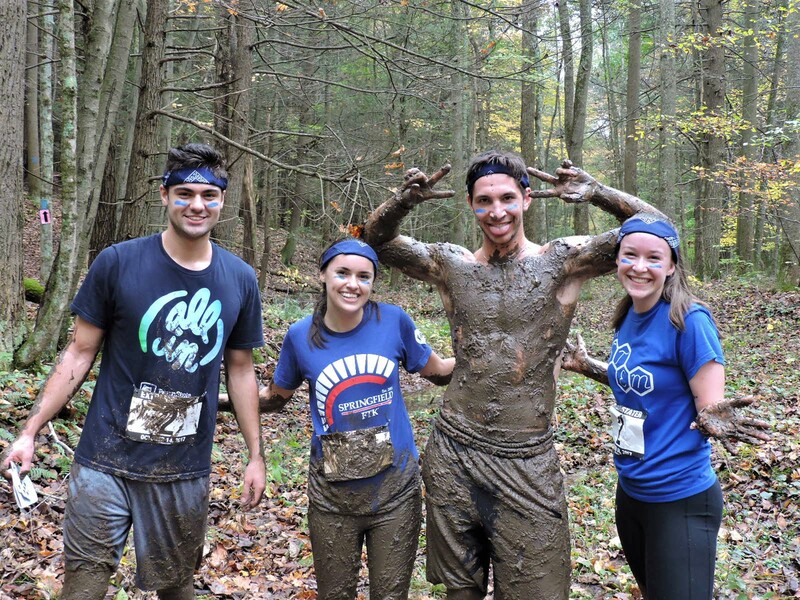 Held at the Stone Valley Recreation Area, 23 teams navigated their way through eighteen different obstacles ranging from mental, physical, and team-building challenges. Prior to the race, teams strategized how they would navigate through Stone Valley. Each team received a map at check-in, along with t-shirts, a goodie bag and race numbers. While some teams competed for the prizes, all were there for the fun! 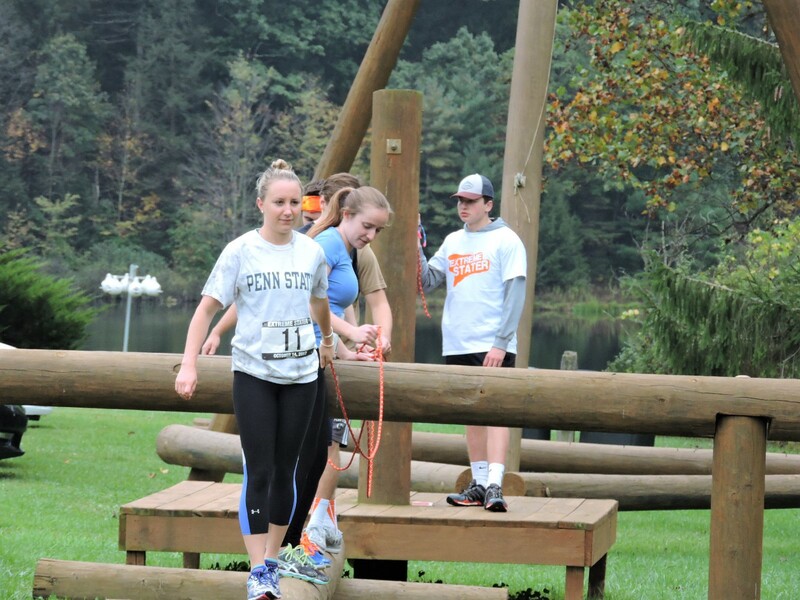 During the race, students enjoyed friendly competition and “outside of the classroom” learning. Team 11 works their way through the ‘team traverse’ obstacle. 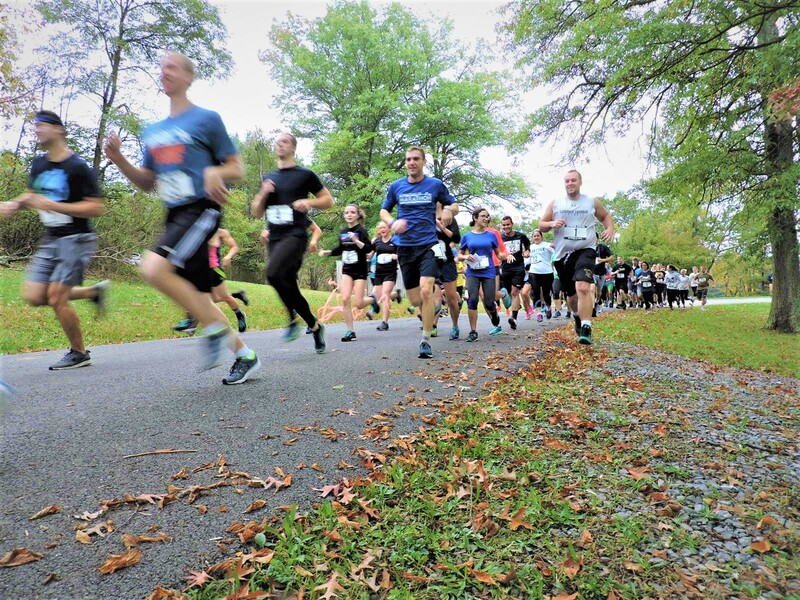 Each team, comprised of four racers, had to travel from the West to the East side of Stone Valley’s Lake Perez through eighteen obstacles challenging each racer’s physical and mental abilities. 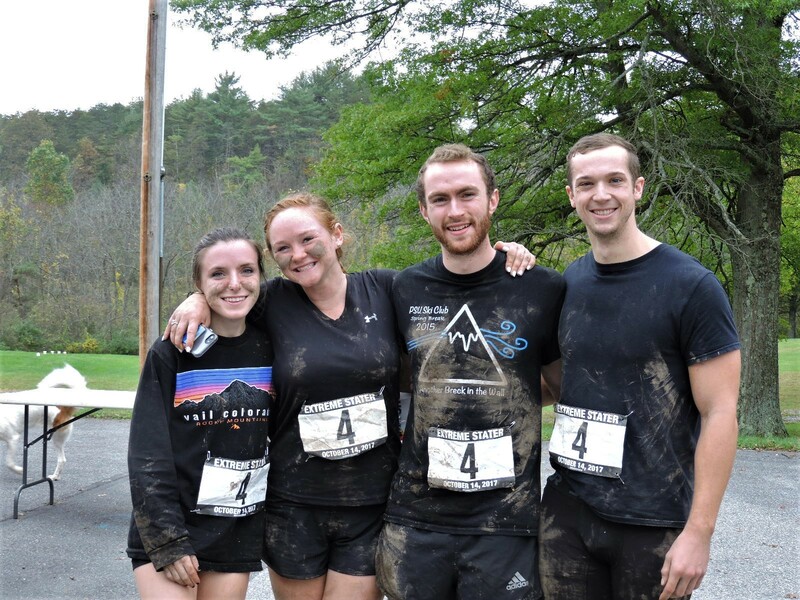 Racers completed the group traverse, trail run, mud crawl, zip line, rock climbing, and so much more to try and win first place. Winners were based on how many obstacles their team finished and how quickly. This year, we are congratulating the PSU Peacocks for winning first place for the third time in a row, finishing in only one hour and eleven minutes! 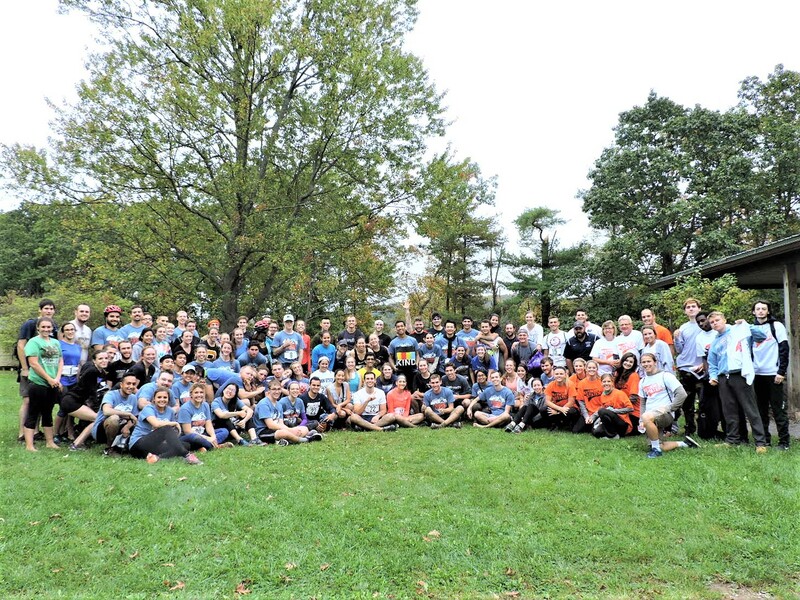 Congratulations to all of the teams that competed, and thank you to both the participants and volunteers for making this the best Extreme Stater race yet! This is an event that students look forward to each fall semester. Get ready for another year of Extreme fun, we’ll see you in 2018! 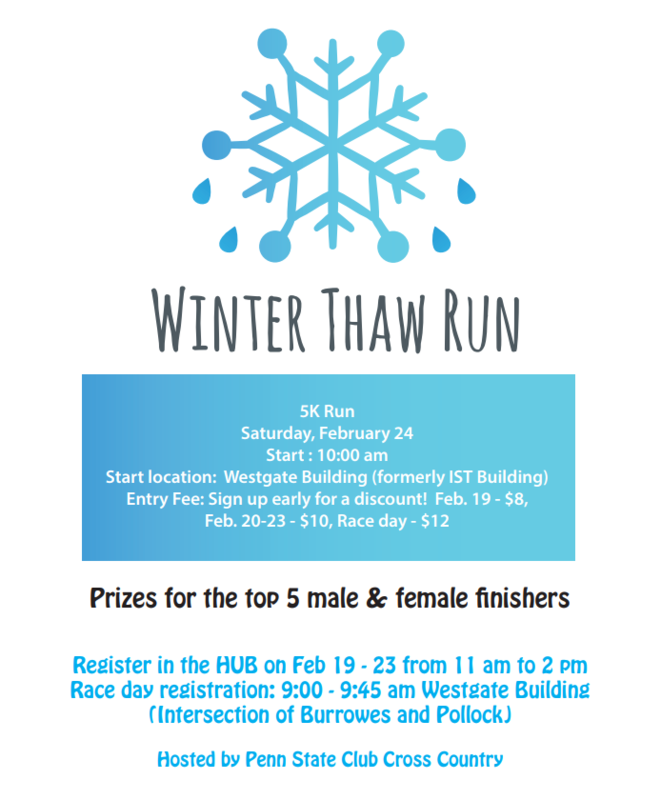 Congratulations to all of our racers! 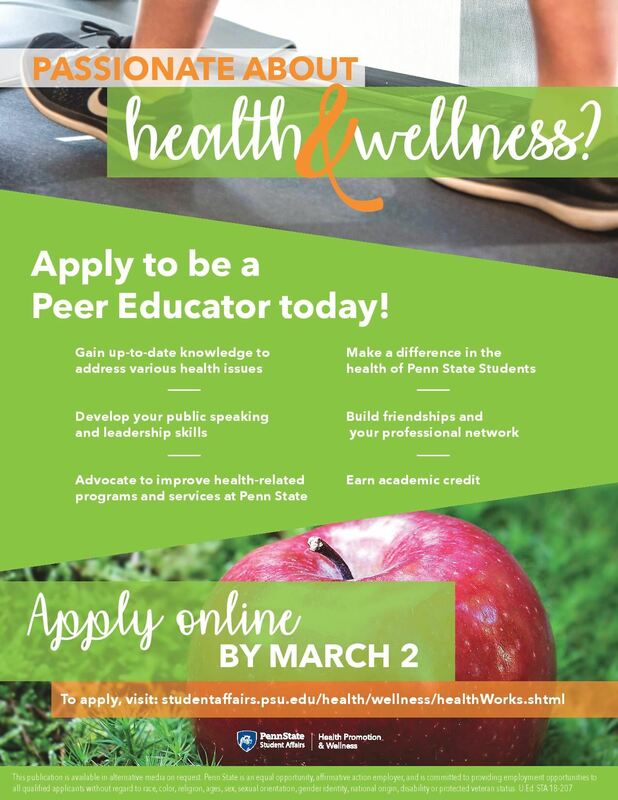 Additional pictures can be found on the Healthy Penn State Facebook page. Supplements vs. Food: Who Wins? With multiple nutrition supplement chain stores opening in State College, many students may be wondering whether or not they should take supplements. The number of protein powders and vitamin supplements on the market can definitely cause consumers to feel confused and overwhelmed. Don’t worry, a dietitian can help you to become a more informed consumer! Many students find protein powders to be a fast and convenient source of nutrition. Whey protein, which contains branched chain amino acids, is a popular protein powder. However, supplements are not regulated by the FDA in the same way that food and medication are regulated. Supplements can be put on the market without any proof that they are safe or that they work. The FDA can remove the product from the market later if they deem it to be unsafe. The good news is that animal and vegetable sources of protein can meet all of your protein needs. If your goal is to build muscle, be sure to get a variety of protein from foods like chicken, fish, lean beef, low-fat dairy, nuts, tofu and beans. Fast and convenient food sources of protein include individually packaged servings of tuna, chicken, chocolate milk, cheese sticks, peanut butter, hummus, and trail mix. The Recommended Dietary Allowance (RDA) for protein is [0.8 x your body weight in kg = _____ g protein/day]. When it comes to vitamins and minerals, most people can meet their nutritional needs by eating a well-balanced diet. Researchers have found that fruits and vegetables have protective properties that prevent cancer, while vitamins supplements do not. The bottom line: Real food is the best fuel source for your body, and most healthy people can meet all of their nutritional needs with food alone. Your energy levels are best when you eat a balanced diet, get adequate sleep, and exercise regularly. If you’d like more help with planning a healthy well-balanced diet, make an appointment with a dietitian by calling 814-863-0461 or by visiting the UHS website.